PlaySneak Peek – Sneak Attack! Looks like Goku's met his match! Krillin must prove himself to both Gohan and Goku if he wants to enter the Tournament of Power. With martial arts tournament rules in play, Krillin's strength isn't solely based on his power level! Goku tries to find Android 17. In the meantime, the tournament stress is affecting the gods of each universe, causing them to bicker among themselves. EP 86 First Time Exchanging Blows! Android 17 vs. Goku!! Android 17 has been busy. Not only has he started a family, but he's been training as well. Will Goku see him as a worthwhile member of the team? And is he even interested in joining? EP 87 Hunt the Poaching Ring! Goku and Android 17's Joint Struggle!! When intergalactic poachers threaten Android 17's island, it's up to Goku to help him save the animals. EP 88 Gohan and Piccolo - Master and Pupil Clash in Max Training! Piccolo tries to retrain Gohan. But Gohan will have to draw from past experiences if he wants to reach his full potential. EP 89 A Mysterious Beauty Appears! The Enigma of the Tien Shin-Style Dojo?! Goku finds the last two members for the Tournament of Power. But someone from Tien's past interferes with the recruitment process. There's time for a sparring match before the tournament. It's an all-out fight between two Saiyans! EP 91 Which Universe Will Survive!? The Strongest Warriors Are All Coming Together!! The Zenos can hardly contain their excitement for the tournament to come. The participating universes are recruiting at different rates, so hopefully they can gather enough warriors before the deadline! EP 92 A State of Emergency! Failure to Reach Ten Members!! Buu is stuck in a hibernation-like sleep! Meanwhile in the 6th Universe, Cabba teaches Caulifla how to become a Super Saiyan. EP 93 You're Our Tenth Warrior! Goku Approaches Frieza!! The 7th Universe is desperate for a tenth member, so Goku seeks out Frieza as a potential candidate. In the 6th Universe, Cabba and Caulifla try to goad Kale into training with them. EP 94 The Evil Emperor Returns! A Reception from Mysterious Assassins?! Goku meets with Fortuneteller Baba to resurrect Frieza. Will attempts on Frieza's new life delay their return to the group?! With disqualification on the table, time is running out! EP 95 Most Heinous! Most Evil! Frieza's Wild Rampage!! Ambushed and outnumbered, Frieza shows his strength. Can he be trusted, or will his psychopathic tendencies get the best of him? EP 96 The Time Has Come! To the Null Realm with the Universes on the Line!! The stage is set and the teams are ready. The universes finally gather in the World of the Void for the Tournament of Power! EP 97 Survive! The "Tournament of Power" Begins at Last!! Let the battle begin! With so many competitors on one stage, teamwork is in short supply. Going off alone could mean the elimination of some powerful warriors! EP 98 Ah, the Uncertainty! A Universe Despairs!! Goku finds himself facing most of Universe 9's warriors by himself. But when Vegeta interjects, suddenly the playing field seems a lot more level! EP 99 Show Them! Krillin's Underlying Strength!! 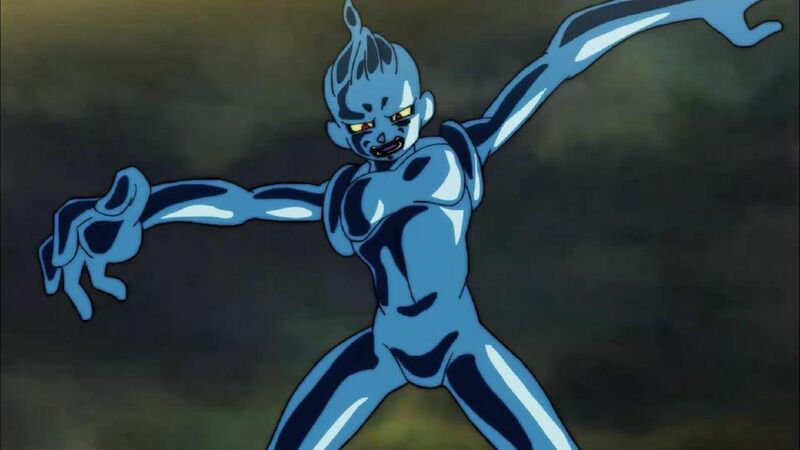 The erasure of Universe 9 serves as a grim reminder that existence itself is at risk. When the dust settles, Krillin and No. 18 break out their spousal synergy against a combatant from Universe 4. EP 100 Rampage! A Crazed Warrior's Savagery Awakens!! Following Universe 7's first loss, the fighting stage is starting to clear out. As ranks are thinned, Goku finds Caulifla and her protégée. But Goku and Caulifla's dueling triggers a frenzied rage that will permanently alter the arena. EP 101 Warriors of Justice Close In! The Pride Troopers!! Three Saiyans are cut off from their teams, so the Pride Troopers attack! As the Tournament of Power progresses, teamwork is proving to be a threateningly powerful tactic. EP 102 The Power of Love Explodes?! The 2nd Universe's Witchy Warriors!! Brianne and her companions from Universe 2 reveal their more powerful forms. It's time to see what they're made of! Has No. 17 bitten off more than he can chew? EP 103 Gohan, Get Ruthless! Showdown with the 10th Universe!! Angered by the loss of their teammate but in no position to fight, the remaining warriors from Universe 2 retreat and regroup. Gohan and Piccolo face off against the last two fighters from Universe 10. EP 104 A Transcendent Light-Speed Battle Erupts! Goku and Hit's United Front!! Universe 6's Hit and Universe 11's Dyspo clash at breakneck speed. Even Hit's Time Skip is too slow to be effective against Dyspo! But when a second Pride Trooper intervenes on his teammate's behalf, Goku arrives to tip the scales. EP 105 A Valiant Fight! Master Roshi's Blaze of Glory!! Universe 4 has it out for Master Roshi! Against multiple opponents, how will technique fare against power? EP 106 Find them Out! Deathmatch with a Furtive Attacker! A deceptive enemy strikes from afar. It's up to the warriors of Universe 7 to eliminate these dangerously precise foes! Sneak Peek – Sneak Attack! Sneak Peek – Ready, Set, Pose! Sneak Peek - Saiyan Vs. Saiyan! Sneak Peek – The Tournament Begins! Sneak Peek – Get Him! Sneak Peek – Father Vs. Son! Sneak Peek – Recruiting Time! Sneak Peek – All You Got? Sneak Peek – Space Poachers! Sneak Peek – Android 17 Found! Sneak Peek – Making an Entrance! Sneak Peek – Hit Me! Sneak Peek – Plan of Attack! Sneak Peek – Freak Out!